Rapid advances in information processing and communications technology have created new opportunities for transportation professionals to deliver safer and more efficient transportation services, and to respond proactively to increasing demand for transportation services in many areas and mounting customer expectations from coast to coast. However, many of these new opportunities are predicated upon effective coordination between organizations - at both an institutional and technical level. To encourage and enable this coordination, the USDOT has developed the National ITS Architecture and related tools to help identify and exploit these opportunities for cost-effective cooperation. This document is one such tool -- it describes how to develop a regional ITS architecture, which will be a cornerstone of planning for effective inter-agency coordination and for deployment and operation of technology-based projects. In 1997, Congress passed the Transportation Equity Act for the 21st Century (TEA-21) to address the need to begin to work toward regionally integrated transportation systems. In January 2001, FHWA published a rule (ITS Architecture and Standards) and FTA published a companion policy to implement section 5206(e) of TEA-21. This Rule/Policy seeks to foster regional integration by requiring that all ITS projects funded from the Highway Trust Fund be in conformance with the National ITS Architecture and officially adopted standards. "Conformance with the National ITS Architecture" is defined in the final Rule/Policy as using the National ITS Architecture to develop a "regional ITS architecture" that would be tailored to address the local situation and ITS investment needs, and the subsequent adherence of ITS projects to the regional ITS architecture. This ITS Architecture and Standards Rule/Policy continues under the current SAFETEA-LU federal transportation act. SAFETEA-LU emphasizes, among other things, congestion mitigation, real-time system management information systems, and planning and approaching transportation operations from a regional perspective. In Section 1201.c of the SAFETEA-LU legislation, State and local governments are required to address information needs and data exchange associated with highway and transit information and monitoring systems when developing or updating their regional ITS architectures. In addition, Section 6001 of SAFETEA-LU mandates that large metropolitan areas (population greater than 200,000) establish a congestion management process (CMP) that provides for effective management and operation of the transportation system within the region. The CMP is something that can be greatly enhanced by receiving archived ITS travel data, among other data points, generated by a deployed ITS network. 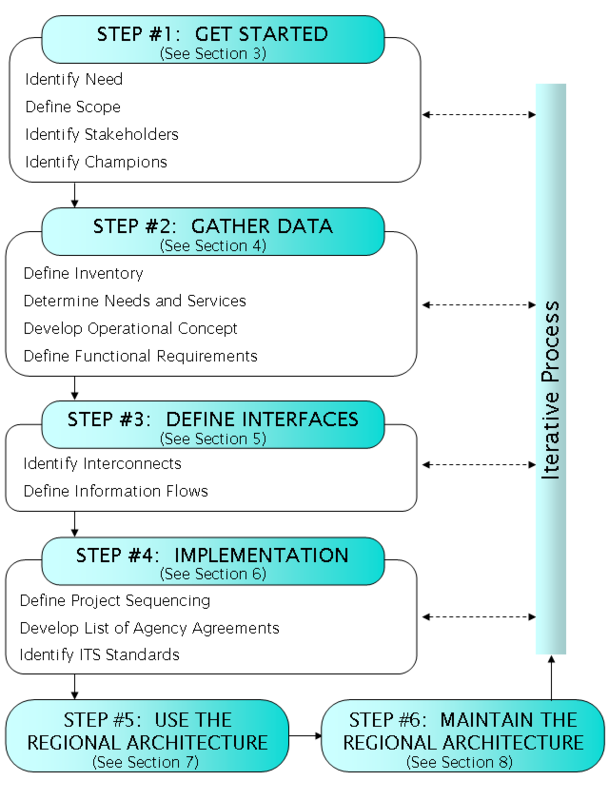 During the stakeholder identification process, the ITS architecture should include this planning need for ITS data throughout the region. ITS architectures provide support in these areas as stakeholders analyze their implementation. This document is a guide for transportation professionals who are involved in the development, use, or maintenance of regional ITS architectures. The document describes a process for creating a regional ITS architecture with supporting examples of each architecture product. In its discussion of the uses of the regional ITS architecture, the document presents an approach for mainstreaming ITS into the transportation planning and project development processes. The guidance is structured around the process shown in Figure ES-1. Within the document, section 2 provides an overview of the process and sections 3 through 6 describe the regional ITS architecture development process in detail. Regional ITS architecture use is discussed in section 7 and maintenance of the architecture is discussed in section 8. Get Started: The regional ITS architecture effort begins with a focus on the institutions and people involved. Based on the scope of the region, the relevant stakeholders and one or more champions are identified, the team that will be involved in architecture development is organized, and the overall development effort is planned. Use the Regional ITS Architecture: The real success of the regional ITS architecture effort hinges on effective use of the architecture once it is developed. The regional ITS architecture is an important tool for use in transportation planning, programming, and project implementation. It can identify opportunities for making ITS investments in a more cost-effective fashion. This step is where the benefits are realized. The results of the transportation planning process - the plans and programs - are an important input to the development of a regional ITS architecture. Once a regional ITS architecture is created, it can by used by stakeholders in planning their ITS projects to support regional goals. It can be used to maximize appropriate integration of projects identified by the planning process. The relationship between the regional ITS architecture and transportation planning is on-going and iterative. The planning process and related outputs also refine the architecture over time as feedback is incorporated as part of architecture maintenance. For the region's Metropolitan Planning Organization (MPO) and for other area-wide and statewide planning agencies, the regional ITS architecture provides information for updating the Long Range Plan, the Transportation Improvement Program (TIP) and other capital plans. It will also provide information for use in other planning studies and activities, including the Congestion Management Plan, Corridor and Sub-Area Studies, performance-monitoring activities, transit development plans, and other locally defined studies or plans. For statewide planning agencies, it will provide information for updating the Statewide TIP, the State Implementation Plan (SIP), and other statewide or multi-region plans and studies. Once ITS projects are programmed, the regional ITS architecture provides a starting point for project development. It provides initial inputs to support concept of operations, requirements, and design of ITS projects. The regional ITS architecture improves continuity across the project lifecycle, from planning through project development and operations. Maintain the Regional ITS Architecture: As ITS projects are implemented, new ITS priorities and strategies emerge through the transportation planning process, and the scope of ITS expands and evolves to incorporate new ideas, the regional ITS architecture will need to be updated. A maintenance plan is used to guide controlled updates to the regional ITS architecture baseline so that it continues to accurately reflect the region's existing ITS capabilities and future plans. Two appendices provide additional background information that may be useful to some readers. Appendix A discusses the tools that may be useful in developing the regional ITS architecture, and Appendix B is a glossary of terminology used in this document.